What do you think? 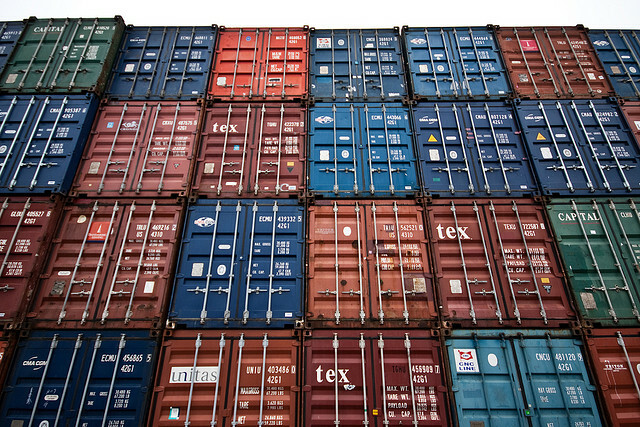 If you’ve worked with shipping containers, do you agree? They’re Just the wrong size as well. Once you board up the inside to flatten out the corrugations, you end up with a space JUST wide enough for a king bed, so the idea of a master bedroom you can walk around in is gone. I do like the portability, and perhaps larger freezer sized containers could work, but as said, SIPS and framing is probably faster, more portable and easier to tailor to your needs. I have to weigh in on this one, because we are just about to build a shipping container home. Most of us don’t board up the corrugations–why hide the material? You can insulate one side or the other of the container, or use insulating paint. Also, depending on the layout of the bedroom (maybe opening up the wall of a container and combining it with another), you can certainly have a king size bed–we will. Thanks April, I’d love to hear of your progress. And I guess to your point – Insulation could be external. I tend to have a fairly restricted view. Already thinking about planning permissions in the UK. I guess, its relative to your needs and desires too! I’m trying to think of that californian builder who did exactly what you’re describing, placed two long containers together lenghtwise to get a more traditional space. I agree- leave the corrugation alone as it’s one of the defining characteristics of this type of design. I’ve been researching the use of papercrete to seal and insulate the outside of the home in order to preserve the corrugation on the inside. Also, the outside corrugation would be retained, and covered in 8-12″ of papercrete for a very unique concrete-looking container surface. Papercrete supposedly is R-3 per inch, so 12″ would be overkill but I’m also factoring in additional material for thermal mass. It seems like the ideal material for this type of construction. It is permeable and susceptible to sponging up water- so a final layer of shotcrete would be in order to seal it all up and smooth things out a bit. I agree. The possibilities are endless if you have the right mindset. Combine 2 or 3 to make an open space that has the strongest frame available. You are getting a higher quality product at less of a cost and less time to build. While all of the cons are true, what is being missed here is the fact that anyone interested in building a home out of shipping containers (if they’ve done even the most rudimentary investigation) knows that there are significant changes to their lifestyle that will need to be made such as sacrificing that monstrous master suite for something more scaled and manageable. And also, where are the Pros in this article? How about the fact that you end up with a solid steel structure that is bug proof, water proof, and nearly tornado/hurricane proof? Or that site erection can happen in days (once prefabrication is complete of course) instead of weeks or months like similar panel systems or stick framing. Oh, and Con #5 is actually wrong. While a standard container is 8′-6″ in overall height (about 7-10″ in interior height) a high cube container (which is what you would want to use for most enclosed spaces) has an overall height of 9′-6″ which gives you an interior height of about 8′-10″. Using exposed ducting and LED lighting you can easily maintain a very comfortable ceiling height. Not to mention insulating the exterior of a container frees up the interior width, again making a more comfortable interior space. The bottom line is there are cons and pros to every single building material used in modern construction. 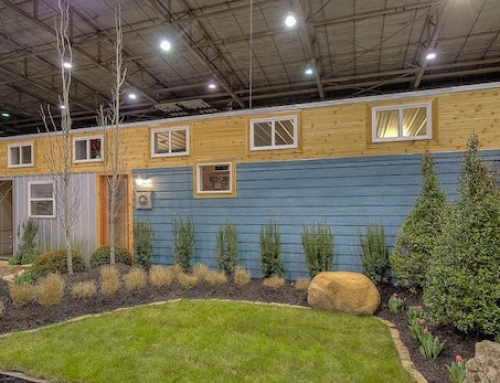 Are container homes viable despite the above mentioned Cons? Absolutely. Are they for everyone? Definitely not. As with any home design, you have to seek out a design and a designer that can meet your needs. I thought the pros, if any, were pretty obvious, but I’ve drawn that out in the article a little more. In my opinion that is the number one reason to look into ISBU construction. In 2005 FEMA asked fire departments across the county to send help in response to Katrina,Rita,Wilma I was one of the people my department sent. I will never forget the destruction. This year my parents old home in Joplin Mo was destroyed by a F5 tornado only the foundation was left. I think it is a good idea to build a house that at least has a chance of standing up to what nature keeps throwing at it. Pro: they make great coffee shops, food trailers, weekend cabins, or a backyard office. i’m working out a really nice cabin idea (well, sort of a hobbit house from space) using these, and one benefit of them is that if you are building something out in a rural area, or on the side in your free time, you can use the containers themselves with very little start-out modification as a sort of barracks while you are out on site working each day. also the treated floors can be coated with a wood-absorbant sealant, and then double coated with an industrial sealant and they would likely be up to snuff. not ultra eco friendly sounding, but the greenest thing is to use whats already there. Some of us live in environments where wood frame buildings would be inappropriate and unlikely to get planning consent. Con# 4 is complete BS. All building materials requires transport and lifting with heavy equipment. Do you really think that pieces of lumber just groes legs and walks out of the mill? I really loved your comment Mj13young. It is true. Some of the Cons are to be considered, but there are more pros as well. One of the most important is the cost. Very cheap to buy, transport, and modify. I’m no expert, but I’ve been gathering info for a year on containers. My blog is http://rocknrollproblems.wordpress.com, and I’ve been chronicling our preparation and building process there. Thanks for sharing and looking forward to following your project! I am in need of some of that insulating paint for a project! Where can I get my hands on some of that? Interesting post, but I’ll have to disagree with some of your points. I’m almost finished with a three container cabin build from the past two years, so I do speak from some experience. I have dealt with Cons 1 and 2 through encapsulation. I researched the flooring treatment on my specific containers (new, one trippers), and feel confident that they are well encapsulated after several coats of industrial grade epoxy. In regards to the interior paint, it’s in great/new condition and with another coat of paint I can’t imagine how I could be exposed to anything. In fact, the vast majority of the interior painted surfaces are covered with 2″ of spray foam insulation and drywall. 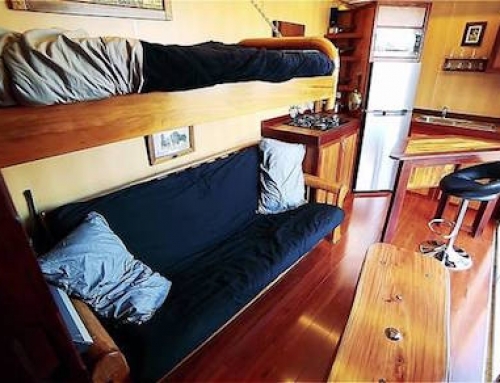 The upcycle energy of Con 3 for my container cabin was virtually nil. I had two welders cut out all of my interior sidewalls in about three hours – not much energy use there. The ecological footprint of Con 4 is similar in that it only took about an hour or so for a small crane to lift the three containers into place. The builders crane we used is mostly used by him to place prefab frame home components into place, so they’re no better in this regard. The containers did have to be transported there by truck, but so would any building material I would have purchased in quantity. You are correct with Con 5 in that you will want to combine multiple containers together as I have done, but consider that to have a large enough frame structure you need to combine multiple 2×4’s together. Either way it takes time and energy to create a larger space from smaller components. Your Con 6 is right on the mark, and this is where many people make a mistake with shipping container construction. 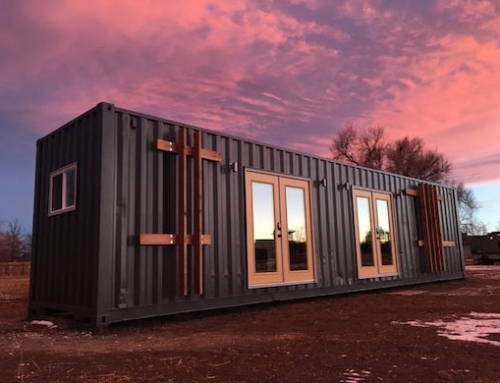 I could have built a similar sized frame building in less time and with much less cost than my shipping container cabin. I would have also gotten a lot less strange looks from my neighbors too. You may ask why I did it then. I really had no interest in their architecture or being green. For me, it was all about the security shipping containers offered. I was tired of my previous cabin being broken into and finally almost being burned down. Even though I like my cabin and what it affords me, I will still recommend standard timber frame construction for anyone unless they have an overriding concern such as mine. Steve, thanks for sharing your experience. I’ve been following your project since maybe November of last year. Love it and hope to share what you’ve done here on this site when the project is complete. Pt. 1 – Toxic paint coatings – those can be sealed away…. Pt. 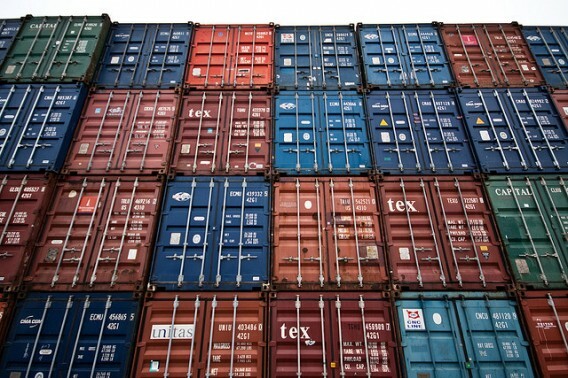 3 – depends on the container… some are bare metal inside. Pt. 5 – You should also take into account that beyond the standard 8x40x8 container, there are those models that come in the 10, 12 foot heights. Where have your found 10′ or 12′ containers? Aren’t the standard sizes 8’6″ and 9’6″? Correct me if I’m wrong. There was a local distributer that had a bunch of 10’6″ – 40′ containers that he said were specially made to ship cars over. He said every once in a while they get a batch of them. He called them SHC (Super High Cube). I build cabins from containers and the cons you mention are non-issues. Epoxy encapsulation for the floors work fine and foam insulation over the interior kills the other, too. Shipping? How do materials (wood, etc.) get to the site in the first place? Fly? Four containers and your ready to go – 1,200 sq/ft ready for fitting. Who needs more? To use ISBUs as the material for a home does not mean that all of your rooms must be the width of a container. There are far more options for building a home out of these than lining up several containers or stacking them vertically. I prefer the plans that use the containers as the outside walls of the home with a great room in the center. Plus, once completed, a home built from containers does not need to look like it was made from them. The same coverings for conventional wood frame homes can be used to cover and insulate the exterior of a container home. 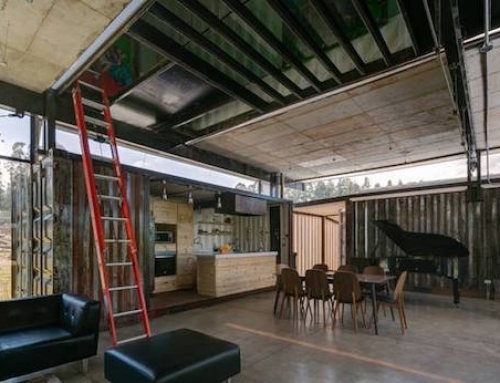 One more pro that seems to have gone unmentioned is the R Value of a home built from shipping containers. 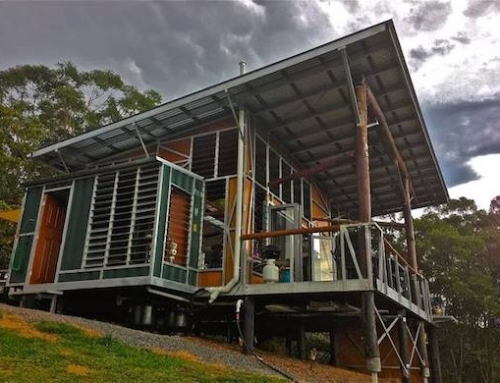 With good insulation practices (which others have pointed out can go on the home’s exterior) and a solid roof, a home built from shipping containers is going to be much less expensive to heat and cool. This will help greatly to reduce the need for power, allowing for clean local power sources like solar to heat and cool A home. 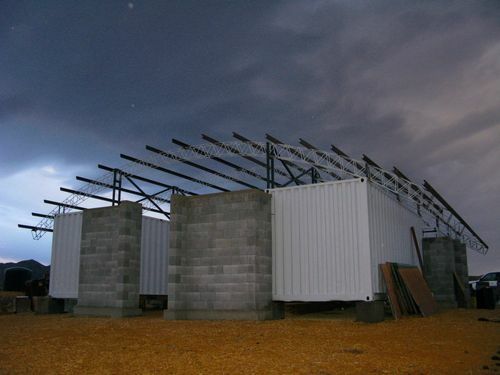 I plan to build a home from shipping containers and do most of the work myself. The roof will be made from SIPs with a metal roof on top of that. The metal roof channels will allow solar panels to be clamped onto the roof, eliminating the need to put nails, screws, or bolts through the brand new roof. My goal is to build a house without a mortgage, eliminating the need for a house payment. I also want to use solar, wind, and possibly water power sources in order to be independent from the grid, with a back up bio-diesel generator for any days that aren’t windy. Having no mortgage and little or no electrical bill will leave quite a bit of income left over to prepare for retirement and for any disasters that might befall us before. what about arch style steel buildings? they have a more usable space, can be converted into a residence and are more versatile for about the same price per sq ft.? I think we should all thank this website for posting the cons of building a home with ISBU containers. I would personally like to thank the website for pointing out that ISBUs often have toxic paint issues. If anyone wants to revisit this thread to renew the discussion, I would like to ask the community a question: How can you safely strip the ISBU of lead-based, etc., paint? Is there a way to get it ALL off without injuring anyone? Is it something I could do myself with rented equipment and instructions from a Kindle e-book (I’ve come to believe everything eventually becomes a Kindle e-book)? The rest of the cons seem manageable. For a wider living space, one could stack two side-by-side lengthwise and hire some skilled labor to weld them together and take out the adjoining sides to create a twice-as-large space. One would be a “job creator”. I’m thinking of starting a WordPress blog about my dream of building an ISBU container home out of four 48′-long HE ISBUs, two stories of two stacked side-by-side in the manner described above. One of the first issues I’m going to work out in advance is how to get all the crappy paint off of them. If you’re interested in a completely solar and off-grid approach, I recommend Larry Hartweg’s e-book (not on the Kindle, a download) from his website http://www.zeroenergydesign.com. The concepts and principles described in his exhaustive work lend themselves well to low-cost ISBU construction. This guy, from what I can tell, is totally legit and has the best, cheapest ideas for heating and cooling your home with next to zero energy inputs other than reliable solar radiation and a little passive geothermal. He is a renowned energy scientist and has an IQ of 174. 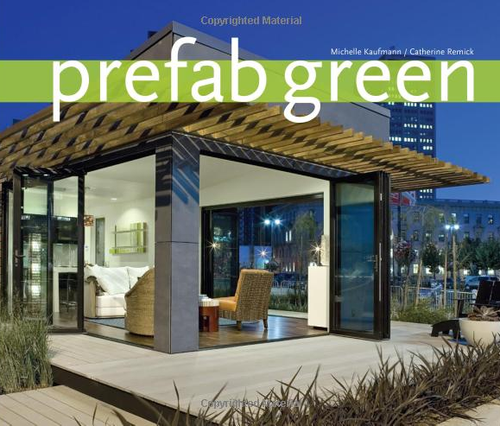 He has a “zero compromise” attitude to zero energy home design and it shows in his work. Please take a look at his website and pass the word around. It’s all about the ISBUs!!! Failed to see any Pros here. And truth is you are greatly mistaken as to many of the cons. Before IBUS or shipping containers as you call them are sold to the general public, they are re painted and normally re floored with new materials that are non toxic. Secondly when building you do ad interior materials which nullify any concerns over hazardous materials. As for the eco footprint, it is extremely far less than any stick built home. 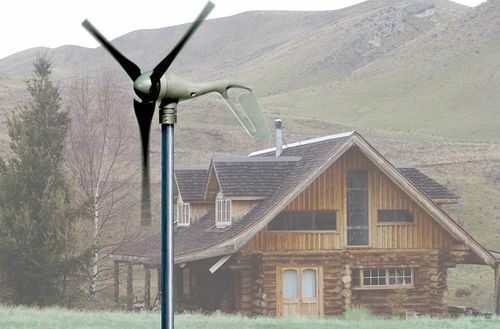 Plus the money you save by manufacturing your home can go towards green technologies to offset such as off grid solar and wind turbine power.I live in a 4000 sq ft Bermed IBUS home. It is three bedroom 2 1/2 bath with huge kitchen, media room, living room and guest room/office. I run off of solar and wind both with a back up generator that has been used only twice in three years. We use the same amount of energy we always have only now…its free and clear of any governmental control and uses absolutely no fossil fuels. In actuality we use less energy now because we Bermed our house and use thermal heating and cooling. Our house stays a constant 64 degrees winter and summer. So my question to you is this…why on earth would you try to dissuade people from doing this. The cost alone is worth it. I built a 4000 sq ft home on 6 acres of land for less than $150,000 I dare you to find another home stick built for that price, that can also withstand earthquakes, fire, hurricanes. All this talk about the restrictions of an 8-foot box and not being able to have a walk-around king-sized bed makes me laugh. We’ve been living in a motorhome that’s 26×7.5 feet in size for years. For us that’s more than enough space so my container design of 3x 20-footers is a HUGE increase in living area.